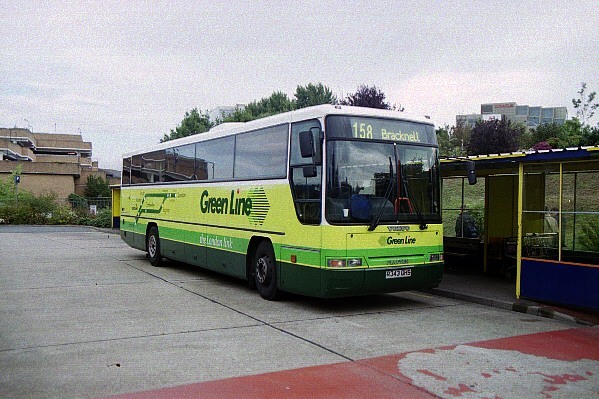 Green Line started as a collection of cross-London bus services linking suburban towns through the city centre. In the 1970s and 80s it grew into a group of local coach services operated by London Country. Latterly it is now a marketing brand for an ever dwindling collection of limited stop services run by local companies. Below is a brief sample of Green Line operation. London Country ECW/Olympian LRC14 (C214UPD) waits at Ecclestone Bridge for departure to Luton Airport in July 1986. This service still exists today. Photographed at the end of a crisp winter's day in old Gloucester Green Bus Station, Oxford is London Country TD12 (YPD112Y), a Duple/Tiger, about to return to London. January 1984. First Beeline recently acquired some Plaxton/Volvos from Glasgow. Their 743 (R343GHS) is seen in Bracknell Bus Station on the 702 service to London. Current Green Line logo.